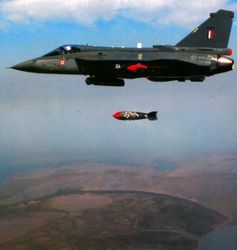 When the supply of spareparts of the Vampire fighter from the United Kingdom was threatened, The Indian Air Force decided to evaluate and induct alternative sources of supply. 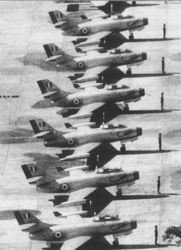 The Ouragan was to be used by the IAF for nearly fifteen years. 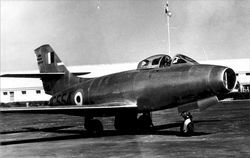 Ouragan IC555 seen on a ferry from France to India during a stopover at Karachi's Mauripur airfield. 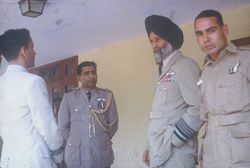 The aircraft probably flown by Sqn Ldr Suranjan Das belonged to No.8 Squadron. 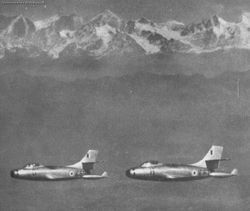 A box of four Toofanis in formation somewhere over North India. 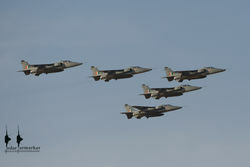 A box formation somewhere over North India. 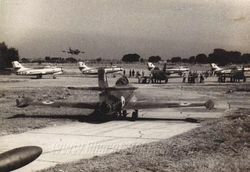 Toofanis at a forward airfield in 1963. 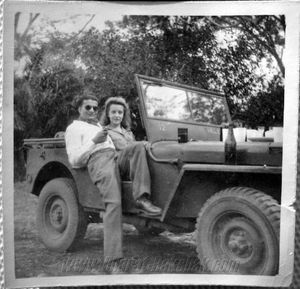 There are atleast nine Toofanis that can be seen in this photo.